Now I’ve never played Dungeons and Dragons, I feel it’s kind of above my head but I’m never opposed to the idea of trying something new, I mean I did just start Dr. Who… but that’s a whole other post. What I do play is Fantasy Football, in fact right now I’m in a draft for my 4th League and the parallels between the two are amazing. So in each game players create a character or team, and based on the characteristics of that character or team compete against each other in battles or quests. In D&D you build the attributes of your character to what you think is best but you are restricted to what you can do by the rules of the game, so you have a certain level of attribute points that you can add that way you can’t have a high level warrior out of the gate who . Just like in Fantasy Football, you build your team with the players with the highest attributes; however you are restricted by the players available to you during the draft, let’s face it not everyone can have Adrian Peterson. However as the game goes one you can build your character to be stronger, either through quests or the waiver wire. When it comes down to game play, D&D uses the di to determine the outcome of battles and quests. In Fantasy we essentially roll dice with the players. Now clearly running for 150yds and 2 TD’s is a bit different then rolling dice… but when you really break it down we are determining who wins on something the actual player has no control over… which is pretty much the point. When a D&D player has a low roll and takes critical damage, its same as having Tony Romo throw 3 interceptions and not throwing for any touch downs, its devastating and can lead to a loss, and trust me I had Romo for a season it was pretty much like rolling a 4 three rolls straight. And let us not forget that Fantasy sports used to be pen and paper games before the internet. 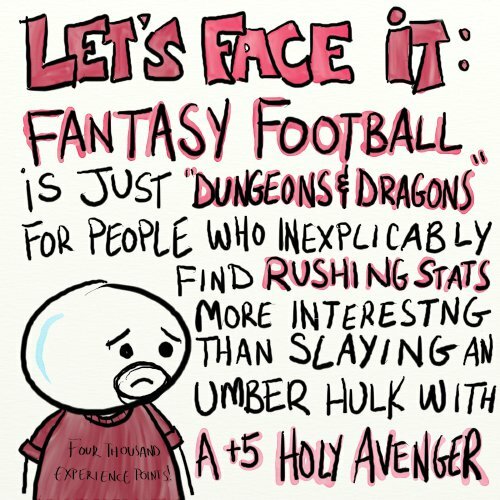 Now I know people who play D&D and I know people who play Fantasy Football and honestly people who play D&D are way less annoying. We’ve all been there, you’re talking to someone on a Sunday or when the waiver wire opens up and they run towards their phones or computers, they only seem to talk about Fantasy football during the season, and they obnoxiously cheer for players on every team. I’ve done it… I’m not necessarily proud but I have… do you know what it’s like to cheer for Peyton Manning as a Patriots fan… its like sinning in church. Even the most social D&D players I know aren’t focused solely on D&D 24/7 they are normal functioning members of society…granted they may be your IT Department, but still normal and honestly if you’re going to have any friends in the office the IT guys are it, trust me. What I’m trying to get to is that the D&D players and the Fantasy Football players may not be brothers, but they are defiantly cousins, and they are the cousins you can probably talk to most at the family wedding or cook out. So to both my jock and geek brethren do not sit back and scoff at one another join each other over a fine brew and talk about your differences and realize how similar you are. Steve is the Drunk Geek Master and creator of the site. ← To Boldy go where…. WTF?!? !